We've now come to the final episode of Series Four and the fifth feature-length adaptation of the series so far. This adaptation was based on the novel One, Two, Buckle My Shoe, first published in 1940. It was adapted for television by Clive Exton and directed by Ross Devenish (who also did The Mysterious Affair at Styles). Devenish's direction is competent, and he does a decent job of trying to bring out the nursery rhyme connection in the opening scenes outside Morley's office, together with Gunning's soundtrack (which can be found on the CD). The production design is as good as always (notice the homage to artist Tamara de Lempicka in the painting in the board room), and the locations work well. They include Lichfield Court, Richmond, Surrey, 'Shrubs Wood' in Chalfont St. Giles (Blunt's country house - previously seen as Mr. Hardman's house in 'The Double Clue'), and a building in Harley Street. There's some nice characterisation bits here, including Poirot's continued fear of dentist visits (as seen in several previous episodes) and Japp doing his garden in Isleworth. As to the guest actors, Joanna Phillips-Lane (Gerda / Helen / "Sainsbury Seale") obviously stands out, almost managing to pull off an extremely difficult bluff for first-time viewers. And, of course, it's nice to see Christopher Eccleston (Frank Carter) of Doctor Who fame. I think the Mabelle Sainsbury Seale / Sylvia Chapman thing is one of Christie's more confusing plots, and even here I can't keep track of who was who when. I get that Blunt kills Morley pretty much only in order to be able to impersonate him (Morley doesn't know about the bigamy) but Poirot doesn't really explain that here. And it only just occurred to me when I saw this: the blackmailing Amberiotis had never been to Morley before, so he wouldn't know his dentist wasn't Morley...but shouldn't he have known who Alistair Blunt was, and therefore recognized the dentist AS Blunt? To people living in 2014, it can seem kind of funny to commit murder to cover up bigamy...but it IS a criminal offense, and in this case, the legality of the marriage to Rebecca would affect her husband's rights to her money. And I'm guessing that it was probably a happy ending for Jane and Julia, in that no legal husband of Rebecca's means more money for them? In the book, in the chapter "Thirteen, Fourteen, Maids are Courting," Poirot observes the couples "courting" in the park and reflects on how the women are not as voluptuous or curvaceous as his "Bird of Paradise," the Countess Rossakoff! Of course, that's totally irrelevant to the plot, but I think it would have been nice to have some indication, at some point in the series, that he remembers her...I think it would be easy to show clips from "The Double Clue" as memories. "I get that Blunt kills Morley pretty much only in order to be able to impersonate him (Morley doesn't know about the bigamy) but Poirot doesn't really explain that here." 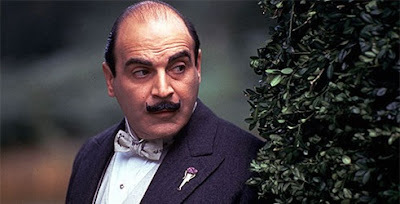 Poirot does say Blunt saw his blackmailer's name in Morley's appointment book, and having killed Morley he was now free to impersonate him as Amberiotis had never seen Morley before. "And it only just occurred to me when I saw this: the blackmailing Amberiotis had never been to Morley before, so he wouldn't know his dentist wasn't Morley...but shouldn't he have known who Alistair Blunt was, and therefore recognized the dentist AS Blunt?" I don't quite get when Blunt saw Amberiotis's name in the appointment book. Was it during his first visit to the dentist early in the episode? That doesn't seem likely, since he was entering the dentist office when Sainsbury-Seal was leaving, and it was after that when Sainsbury-Seal told Amberiotis about Morley. So unless she got back to her hotel, met with Amberiotis, and he called to make the appointment all while Blunt was in the dentist's office, that doesn't work. Also, where do Poirot and Japp find the Gerda/Sainsbury-Seal woman to ask her about Morley's murder? She doesn't move into Sainsbury-Seal's hotel room, because the hotel people think she's vanished. The plot doesn't quite work in my opinion. One of my favourite episodes and a pretty good book too. Raikes and Barnes aren't missed terribly (although they serve to put Poirot and the reader on the wrong scent in the book), and increasing Miss Montressor's role makes sense (even if it is a risk to show her on screen). One of the more complicated plots, but I like it. (Although it does hinge on Blunt getting the appointment immediately before Amberiotis!) But I do prefer the denouement in the book, with just Poirot and Blunt one on one. How odd that we see the murder right at the start, when a key element of the story is uncertainty over whether Morley committed suicide. And that the India prologue confirms Mabelle did know Blunt's wife when that's also mean to be uncertain for most of the story. But I think showing us Blunt's engagement to Gerda, the later visit to a Gerda Chapman, and Amberiotis taking a definite interest in Blunt having a wife called Gerda, gives away too much and points a finger squarely at Blunt before the murder has even taken place. But maybe that's easy to say in retrospect. Brave to show us so much of Gerda and the real Mabelle at the start. There's some wonderfully melodramatic chin-stroking after Poirot leaves Lionel Arnholt. I watched the feature-length TV adaptation first, not having read the book or knowing anything of the plot (I listened to the audiobook the next day). The thing that didn't work for me in the TV prog is, knowing that 'two women' existed and seeing that one was clearly impersonating the other. In the audiobook there is no hint of two women, only the mystery of things not quite making sense which is part of the intrigue. In the TV prog Gerda is clearly up to no good. Then she appears to be in the employ of Blunt as his secretary! Through the soft-focus it was very clear to me that it is the same actor. Big mistake I think. Ambriotis's appointment was last minute. So the first Blunt would have known about his visit to Morley would have been when Blunt himself was at his appointment. So, did he plan the whole Ambriotis murder while having his tooth filled? Why did Blunt have to murder Morley? Not to swap the dental records (I've dismissed that above). When he went to his appointment he didn't know about Ambriotis's appointment, so he didn't go with the intention of impersonating Morley. And do people carry a gun as a habit when visiting the dentist? Hmmm .... not too convinced, mon ami. Ah, and one more thing! (In the TV episode) Even Poirot didn't spot what looked like a spent cartridge/bullet about 6 inches from the gun, that only appeared in the scene when Frank Carter described what happened in flashback. It wasn't there in any of the other shots of the murder scene. When Blunt decided to do away with Morley, it is an amazing coincidence that after murdering Morley, the very next patient is Amberiotis. This is extremely unlikely.